In this delightful book, What Can You See? Animals in the Night, children will discover the secrets of nocturnal animals from all over the world. Hidden creatures and surprises abound in the pages, encouraging children to eagerly hunt for every one by illuminating them with the unique star-shaped UV light supplied. 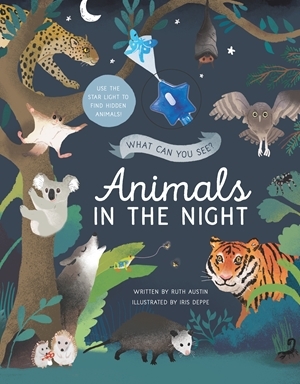 Author, Ruth Austin, provides factual details, in rhyming text, about each of the cleverly camouflaged creatures, with clues to help children solve the mysteries of identifying the animals. Creatures are featured from lands across the world including the Americas, Africa, Asia, Australia and Europe. The rich illustrations, by Iris Deppe, convey an enveloping warmth, with depth and perspective extending to the edges of every page. Each page provides many fascinating sights to seek, even before finding the hidden creatures. In the final page, all of the book's creatures are identified, and readers may find themselves returning to each page to ensure they had discovered every one. Children will be rushing to bed to turn down the lights and explore the mysteries within this lovely, non-fiction, activity book.